These little ones give me a lot to be thankful for! ,,,and a feast among "Pilgrims and Indians". Love that the littlest guy in my class made the largest hat! I've truly enjoyed meeting new bloggers and revisiting friends. "HELLO, LOVE RILEY BLAKE COLLECTIONS! Joanie from Joanies Trendy Quilts is the winner of the 1" Glass Hexagon Template! "I have a basket by my recliner with 1 inch hexies. I love hexies but I love them in all sizes." Be watching for some happy mail Joanie! 1 1/2" Glass Hexagon Template! "God I'm crazy about 1.5 inch hexi's too." Sue who is a blog reader is the winner of this cute snap bag. "I've made quilt blocks for Margaret's Hope chest which is a great organization! Winners, I can't wait to send "happy mail" your way! Check your email in box to send me your mailing information. And I recommend everyone take a minute to check your no-reply status. Unfortunately, I had over 70 no-reply entries. Tonight found me sipping wine as I texted with my mom during Dancing With The Stars, both as I baked 5 dozen cupcakes to be turned into frosted turkeys tomorrow. Our Second Grade tradition is to end our Thanksgiving unit of study with a "feast" between our two second grade classrooms. One class makes Indian headbands while the other makes pilgrims hats. Then we join together for a "feast". Quite honestly, I think the kids are more excited that they get to eat in the classroom together, but never-the-less, it's a fun filled afternoon! Stop back tomorrow for some Thanksgiving cuteness!!! With relief, I'm really liking how this one is coming out!! I'm loving how the "design" is there, but in a subtle way. I'm finding the variegated threads are complimentary to a quilt top this way. Thanks for stopping by! Hope you weekend was great! I mean seriously, I don't even have a data plan of my cell phone! So this is a big deal for me! I'm grateful I have a routine established so I can continue to be involved instead of just sitting on the outside reading everyone else's blogs. I'm grateful for you, my new quilt blogging friends. Really! Thank you for visiting my blog and for supporting me with your kind comments and emails. You are like my "virtual" quilt guild. I always enjoy grabbing a cup of coffee and visiting your blogs for inspiration, support and friendship. If you are new to my blog, WELCOME! That's a picture of me over on the right. This is a quilting/sewing hobby blog. 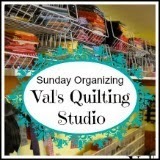 Visiting my blog, you'll notice I'm a pretty eclectic sewer who dabbles in applique, English Paper Piecing, (love my hexagons) traditional and out-of-the box piecing, long-arm quilting, quilt/sewing area organizing (See my Sunday Organizing Series). And, as if that's not enough, 2014 will find me exploring wool by participating in Sue Spargo's BOM. I have many W.I.P. but let's not talk about those! (wink! wink!) Feel welcome to check out my "pages" and/or "labels" in areas that may have sparked your interest. Hopefully you like what saw and you'll become a "follower" and I can visit your blog as well. Thursday afternoon at Michelle's blog. Check that out and visit all the other bloggers. Great prizes. Give-Aways to say thanks and welcome! "I'm crazy about 1" Hexi's too!" and/or "I'm crazy about 1 1/2" Hexi's too!" FYI: I'll pick each of the "category" winners using Mr. Random Number Generator. I will announce the winners and highlight their blog here at Val's Quilting Studio on November 27th. I will also email the winners, so make sure you are not a no-reply blogger. Everyone is welcome to enter as I'm happy to post internationally. (Oh and I probably won't reply to giveaway comments as it can sometimes be a little overwhelming.) Good Luck! The most awesome collection of orange fat quarters arrived in the mail today. 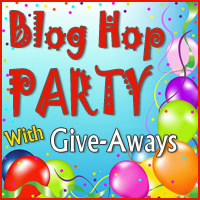 Also tomorrow another great Quilter's Blog Hop Party starts, created by Michelle from Quilting Gallery. Her site is include the quilting bloggers directory, a listing of quilt shops & services, a world-wide directory of quilt guilds and much more. If you haven't checked out her site yet, you should jump over there and do so. The Quilter's Blog Hop Party is really a chance for me to thank my regular blog readers, to host a fun giveaway and to fill you in on news and events happening here on my blog. Be sure to stop by as I celebrate my 100th Post with a few give-aways myself! I love that they stack neatly on top of each other, snap securely shut for safe travel and I can easily label them for quick finding. After not being behind my long-arm for almost six weeks, I spent the weekend playing! I used only FMQ as I worked on this quilt top from/for Project Linus. I needed to do this. I needed to follow my own creative flow. This quilt helped me find my groove again and rebuilt my confidence. Someone (not a blogger) told me a few weeks ago, that I ruined a quilt. It was this quilt: A Star Studded Finish! (Funny thing is, I'm really proud of my skill progress on that one...so I was shocked when they made such a comment!) Luckily, I was able to keep this person's opinion in perspective and I was able to stand up for myself. But in the back of my mind, it reminded how important it is to be kind and supportive of each other as we all work to develop our skills and find our own style. I hope you all are living well, loving much and laughing often...especially at people who don't always appreciate your quilting style! LOL! Somehow I never got this note sent to you last week! Where did the time go? I wanted to let you know that EVERYONE was in awe when they saw your quilting on the quilts I turned in for project Linus! Especially, the Halloween quilt! Wow! Donna asked if you would quilt for other people. I told her, yes, definitely! She might have a quilt or someone in mind that needs something done. I'll ask her. I plan to call her later this week. Thank you, Val. Have a great week! Am I the only one who hates this? You're in the middle of a sewing project and your bobbin runs out! I also use it to wind all my applique threads for easy access and travel. Just another little way I keep organized. ...and this one is for my guy! His birthday is this month and in February we will be celebrating our first 25 years as Mr. and Mrs. (Love it!!) So I'd say it's about time I made him his own quilt for the ol' "Man Cave" don't ya think!? A big thank you Amy and Madame Samm for hanging a carrot in front of me!! I started with a layer cake of soft, cozy flannels. Sewed them together in rows of 6x7. Here it is finished and waiting to be quilted. Luckily, I have a long weekend off and ten more days until his birthday! I think I can easily have it done for his big "five-O" celebration! I hope. (I'm thinking of just quilting it with a fun pantograph??) I have a green flannel for the back and a dark blue flannel for the binding. I've never made a flannel quilt before but one thing I can tell ya is, it is the coziest quilt I have ever made and it's not even finished yet!! I think I'll be making myself one very soon as it's that cozy!! I LOVE IT! 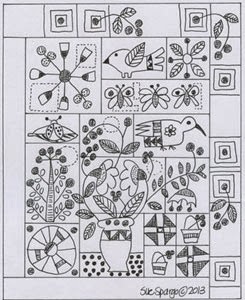 This summer I started a wool sampler with creative stitching inspired by Sue Spargo. It was fun to create and even more fun to practice my pebble quilting on! This now happily hangs in my bathroom, truly making it easy to live, laugh and love! These babies are STRONG! I've used them to hang larger quilts as well. 2014 will find me sharing more wool/creative stitching, as every year I treat myself to one BOM and Sue Spargo's BOM called: In Full Bloom is my choice for 2014! It will definitely make for some wonderful "happy mail" don't ya think!